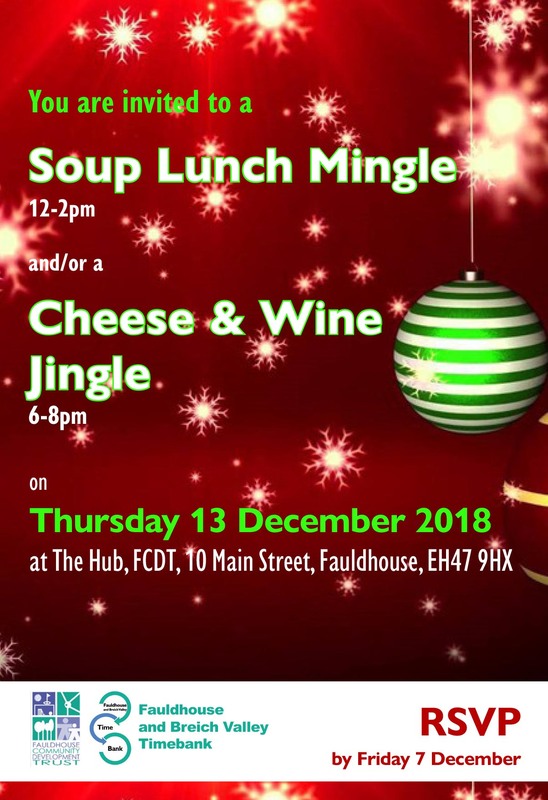 Come along and join in the festive fun. 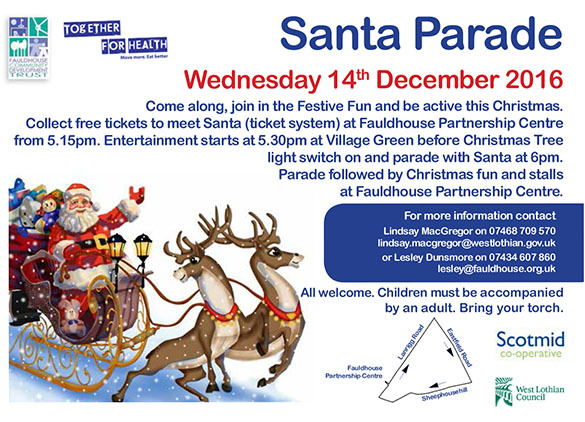 Collect free tickets to meet Santa (ticket system) at Fauldhouse Partnership Centre from 5pm. Parade with Santa at 6pm followed by Christmas fun, music and stalls at Fauldhouse Partnership Centre. All welcome. Children must be accompanied by an adult. Bring your torch. 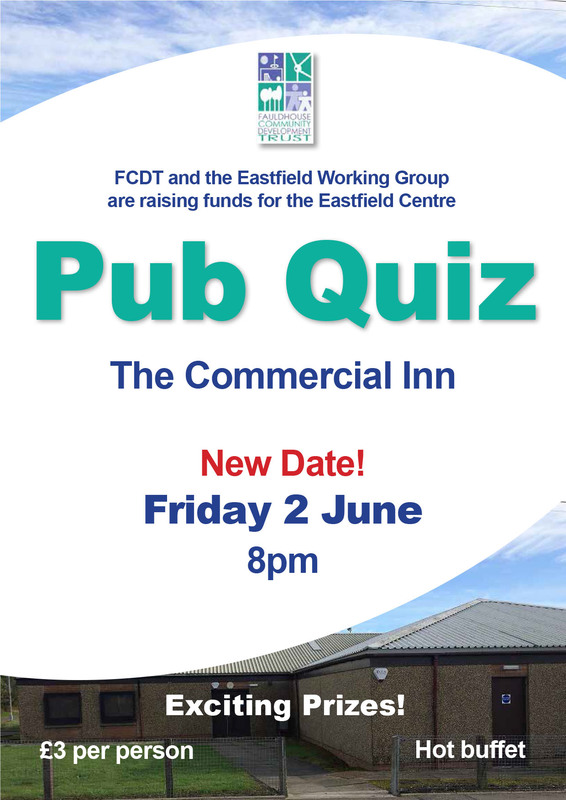 Timebank events to thank all this year’s volunteers and those who have been involved with FCDT. The Take a Break Craft Group hosted a Tea & Toast to raise funds for Poppy Scotland in The Hub, 10 Main Street, Fauldhouse. The group raised over £250. 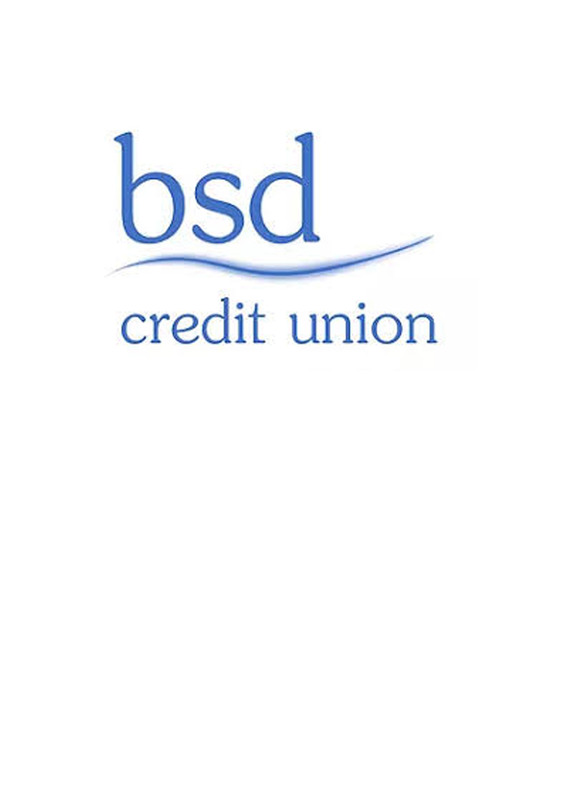 They also raised a further £400 for Macmillan Cancer Support when they also hosted an event in September as part of the World’s Biggest Coffee Morning. Venues included The Hub, the Village Green, St Andrew’s Church Hall and the Salvation Army, Fauldhouse. 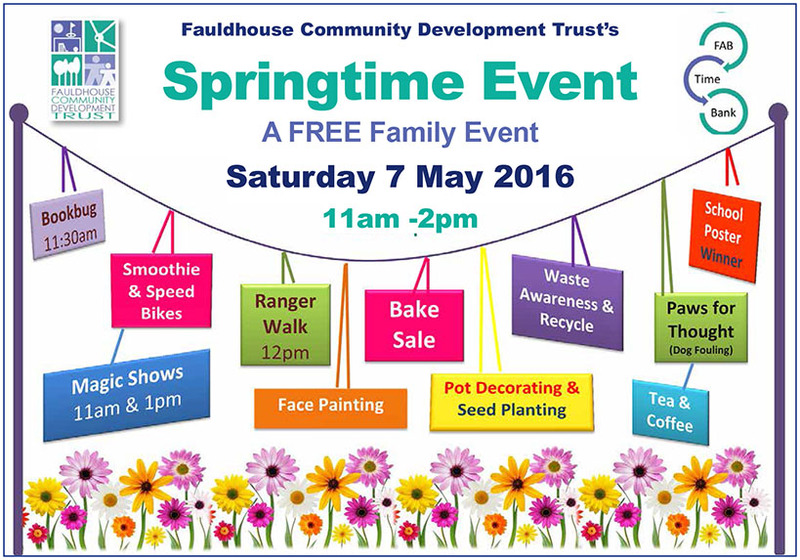 The F&BV Timebank project held their Springtime Event on 7 April in The Hub. 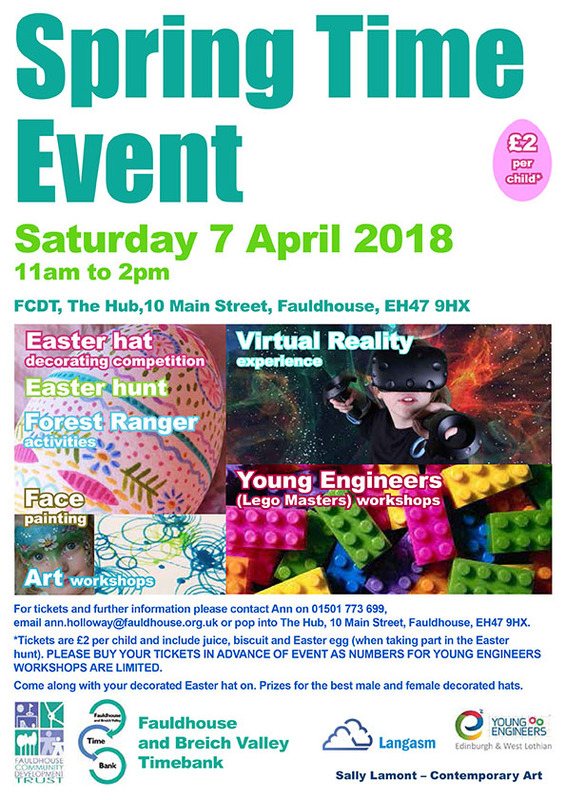 Children could attend one of three Young Engineers workshops, have a go on Langasm’s virtual reality headsets and try Sally Lamont Contemporary Art’s workshops, make ‘woody’ necklaces with the Forestry Commission’s Ranger, have their face painted and have a go at our Easter Treasure Hunt. 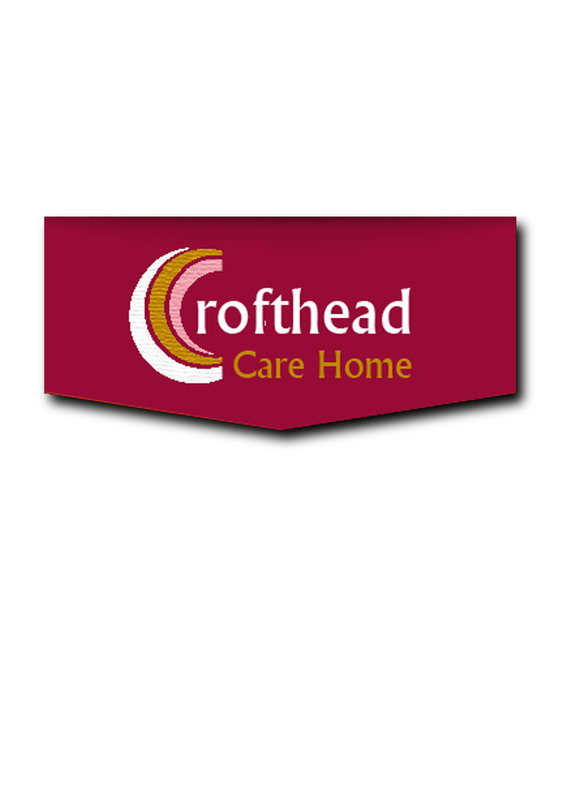 Children came along with their decorated Easter hats and there was prizes for the best male and female decorated hats while parents had a coffee and cake at the mini pop up cafe. 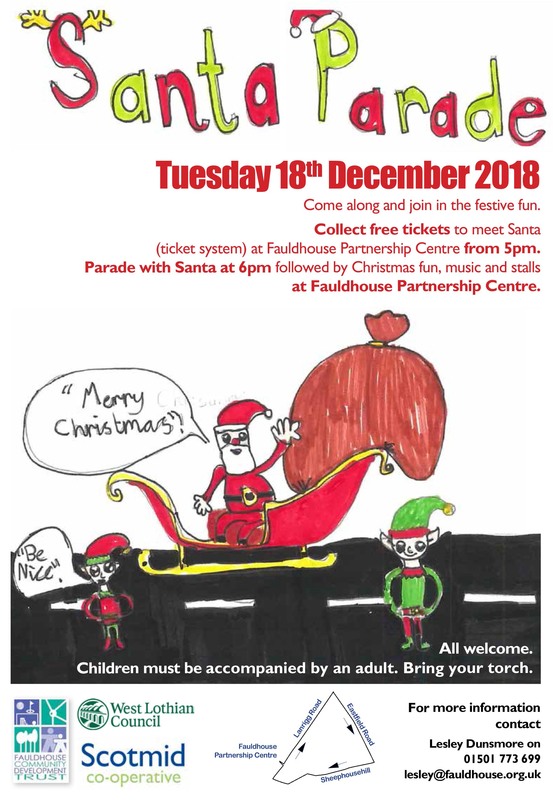 Fauldhouse Community Development Trust, Fauldhouse Partnership Centre and Together for Health worked in partnership for a fourth year organising the Fauldhouse Santa Parade. Santa and his sleigh led a parade from the village green through the village. Back at The Partnership Centre, there was an opportunity for children to meet Santa in his grotto, have their photo taken, decorate Christmas baubles and make some reindeer dust in the elves’ workshop. There were stalls and a chance to look in the sparkly grotto. Mrs Claus was in her igloo in the Library telling winter stories. 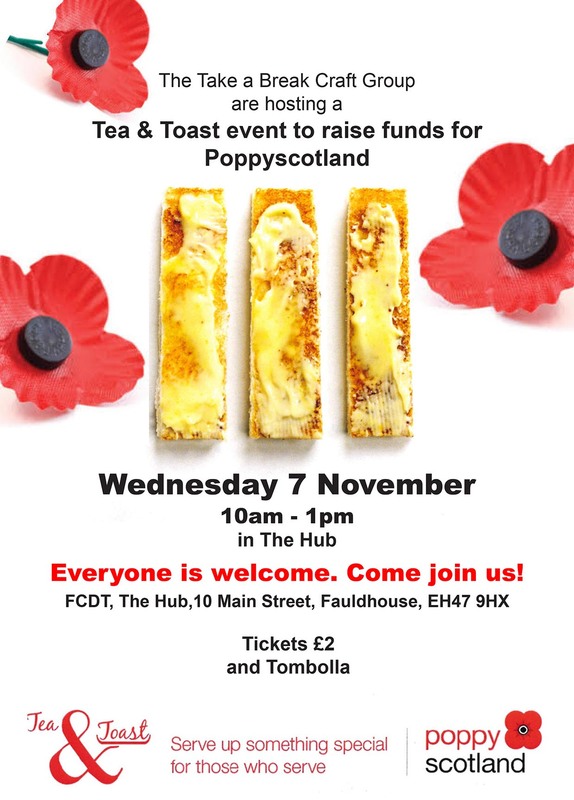 Take a Break Craft Group and Timebank hosted a Tea & Toast to raise funds for Poppy Scotland in The Hub, 10 Main Street, Fauldhouse. It was FCDT’s Annual Fair Day on Saturday 2 September from 11am-2pm. 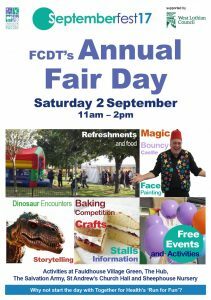 There was T- Rex fun, face painting, magicians, Samba music, storytelling, information stalls, baking, refreshments, crafts, bouncy castle and slide, children’s yoga, den building and baby sensory activities. 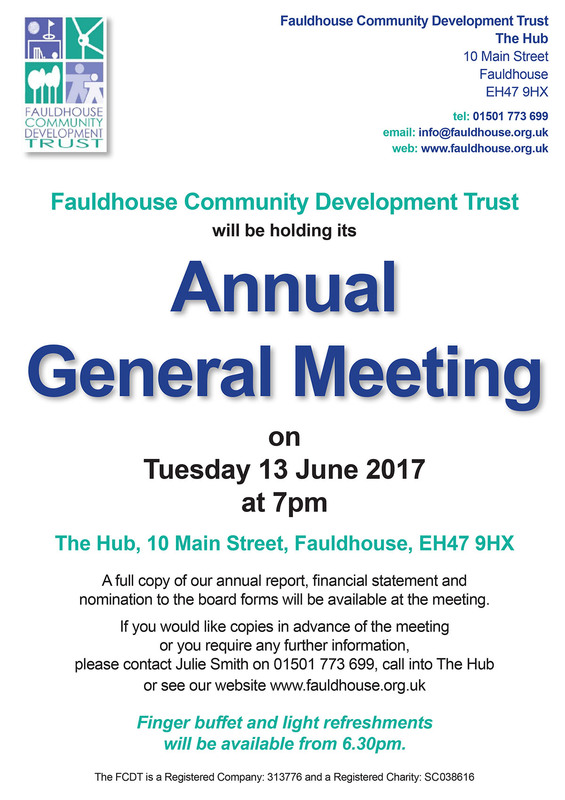 Activities were held at The Hub, St Andrew’s Church Hall, Salvation Army, the village green and Sheephouse Nursery gardens. It was a great day! 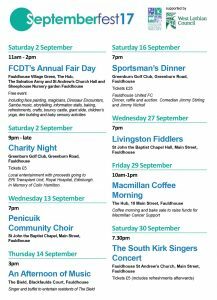 September saw a month of musical events in Fauldhouse. 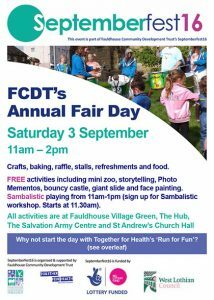 Septemberfest kicked off with FCDT’s Annual Fair Day on Saturday 2 September. 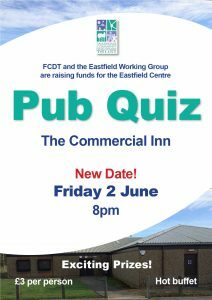 Local entertainment with proceeds going to ERI Transplant Unit, Royal Hospital, Edinburgh. In Memory of Colin Hamilton. 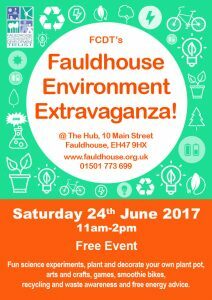 Activities included fun science experiments, planting and decorating your own plant pot, arts and crafts, games, smoothie bikes. There was also recycling and waste awareness and free energy advice. 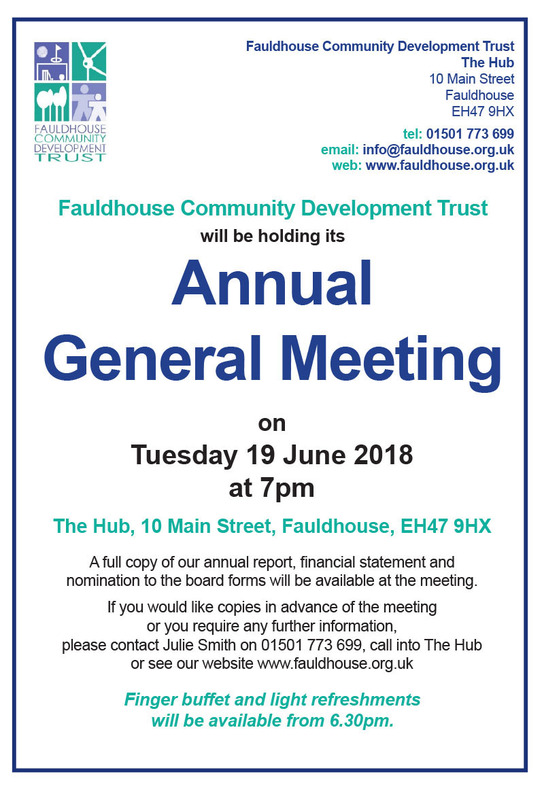 A full copy of our annual report, financial statement and nomination to the board forms was available at the meeting. Fauldhouse Community Development Trust and Together for Health worked in partnership for a third year organising the Santa Parade. 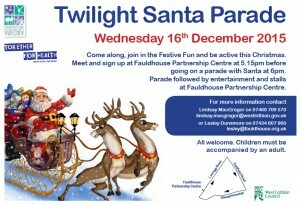 Following the Christmas Tree light switch on at 6pm, Santa and his sleigh led a parade through the village. Back at The Partnership Centre, there was an opportunity for children to meet Santa in his grotto, have a photo taken with a Frozen character or two, meet a fairy and her helpers and make some fairy reindeer dust. There were stalls and the chance to make some creative Christmas crafts. Mrs Claus was in her igloo in the Library telling winter stories. The Salvation Army played carols during the evening and there was a debut performance by FCDT Timebank Project’s new community choir. 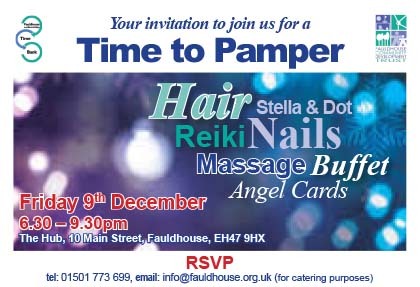 Volunteers and Timebank members were invited to a Time to Pamper evening to say thank you for their involvement with the Timebank and volunteering with FCDT. Those who came along had the opportunity to have their hair and nails done, reiki sessions, massage sessions and angel card readings plus a buffet and stalls. 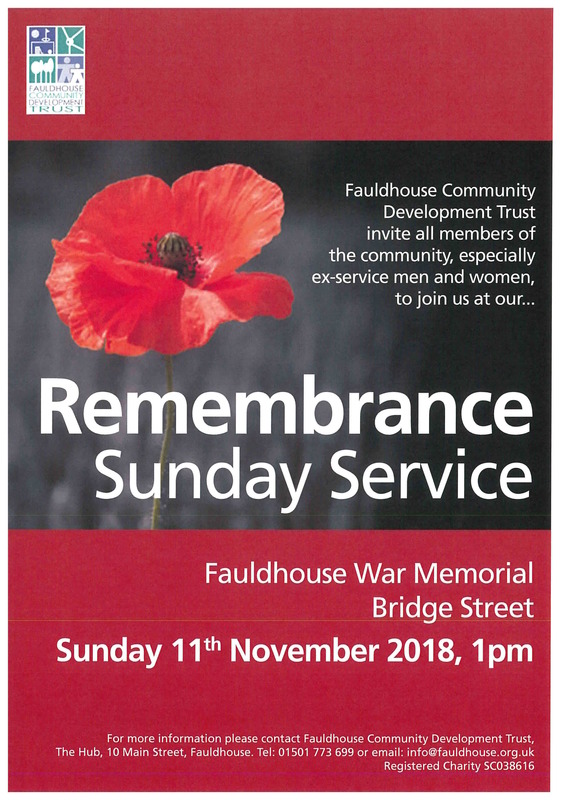 Fauldhouse Community Development Trust invited all members of the community, especially ex-service men and women to our Remembrance Sunday Service at Fauldhouse War Memorial, Bridge Street. 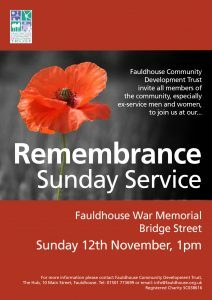 There were crafts, baking, raffle, stalls, refreshments and food. 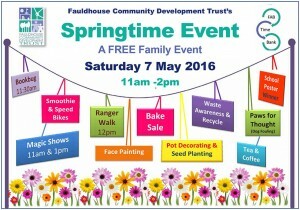 Free activities included mini zoo, storytelling, Photo Mementos, bouncy castle, giant slide and face painting. Sambalistic played from 11am-1pm. 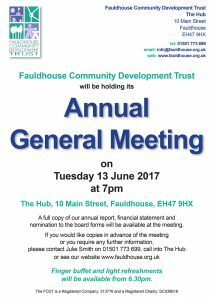 FCDT held its Birthday Lunch and AGM in The Hub, 10 Main Street, Fauldhouse, EH47 9HX. 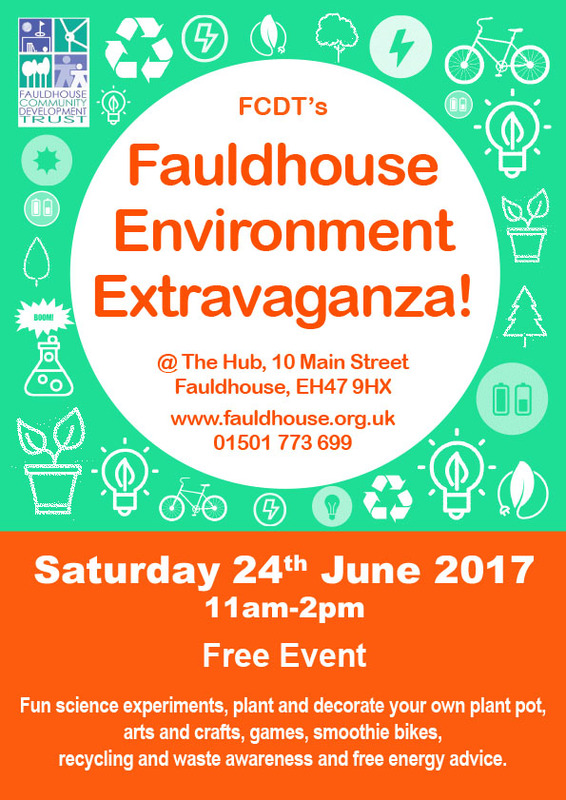 A FREE family village event with an environmental theme. There was a ranger led walk in the local forest making s’mores at a campfire along the way (leaving from The Hub at 12 noon). 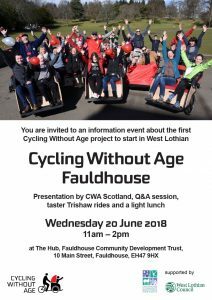 At The Hub there was stalls, face painting, Magic Man performances, art workshops, a Bookbug session (11.30am-12 noon), planting spring flowers and wildflower seeds. 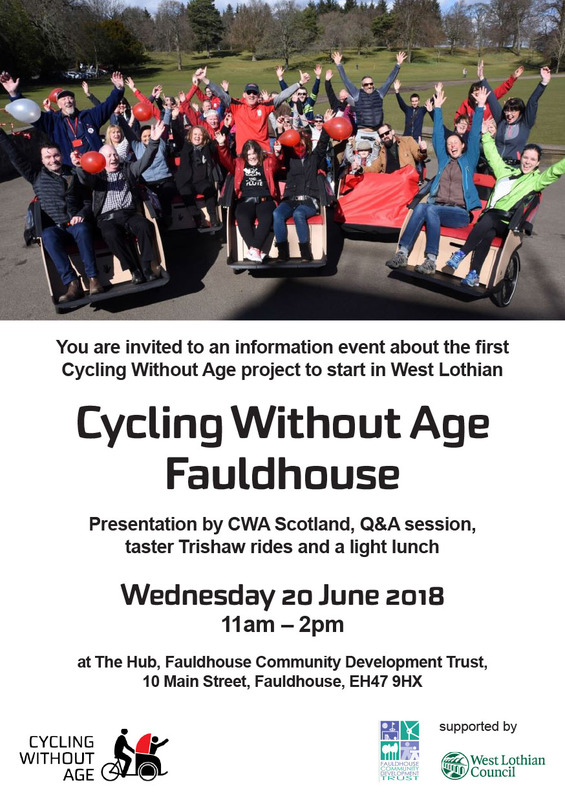 There was smoothie-making with Together for Health using their new kid’s smoothie bike, an adult cycling challenge with the GRC Triathlon Club plus coffee and cake at a ‘pop-up’ cafe in The Hub. Results of the School’s poster competition was announced at the event. 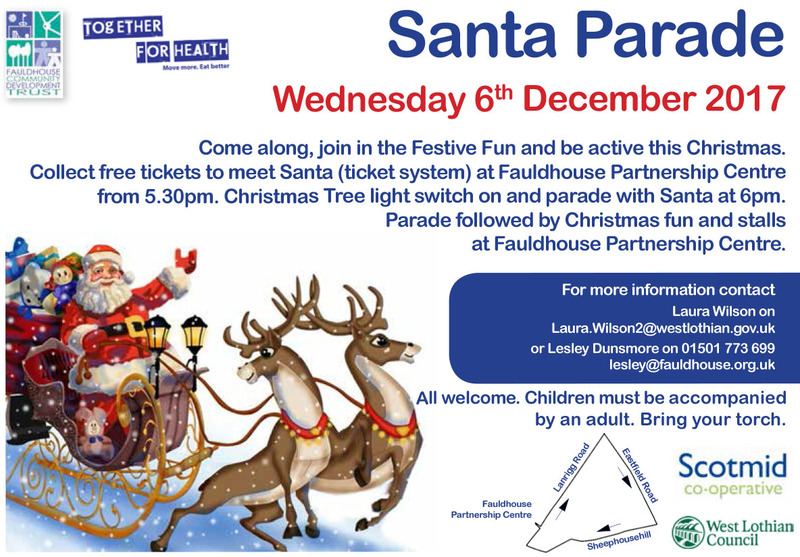 Fauldhouse Community Development Trust worked in Partnership with Together for Health for a second year to organise a Twilight Santa Parade in Fauldhouse. People came along, joined in the Festive Fun and were active at Christmas. 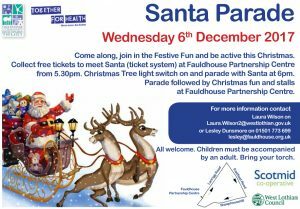 Everyone met at Fauldhouse Partnership Centre at 5.30pm before going on a torch lit parade through the village with Santa at 6pm. There was also Christmas entertainment including the Salvation Army band playing Christmas carols and there were stalls at the Partnership Centre. There was an opportunity for children to meet Santa and have photos taken with one of the Frozen characters. 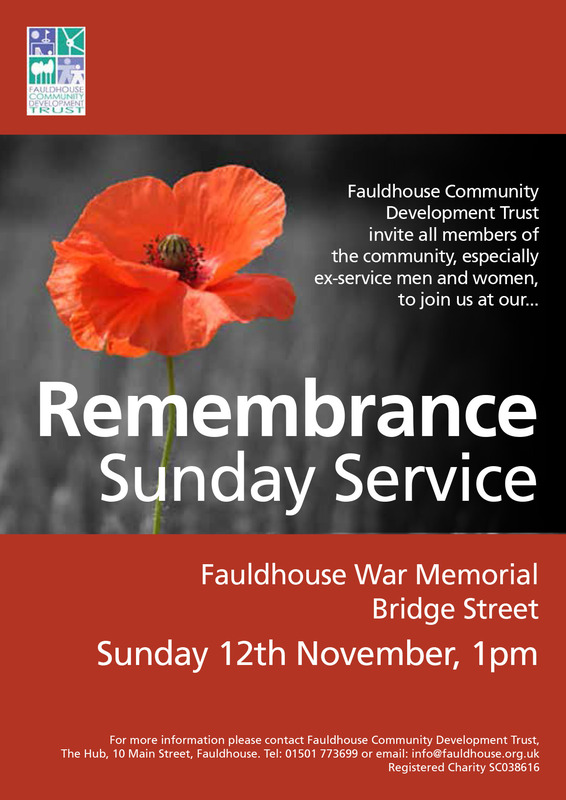 Fauldhouse Community Development Trust invited members of the community, especially ex-service men and women to their Inter-Denominational Remembrance Service at Fauldhouse War Memorial, Bridge Street on Sunday 8 November at 1pm. 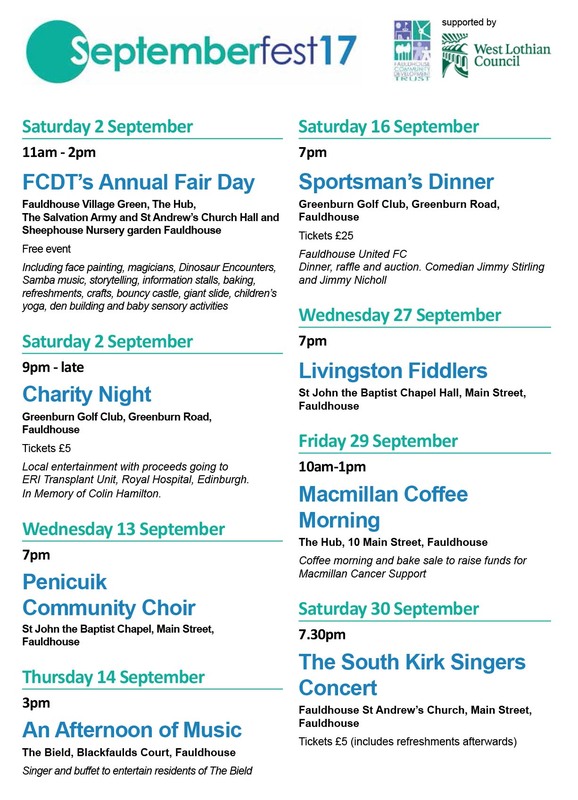 Fauldhouse Community Development Trust’s Septemberfest15 started on Saturday 5th September 2015 and offered a month of musical events in a variety of venues around Fauldhouse until Tuesday 29th September. 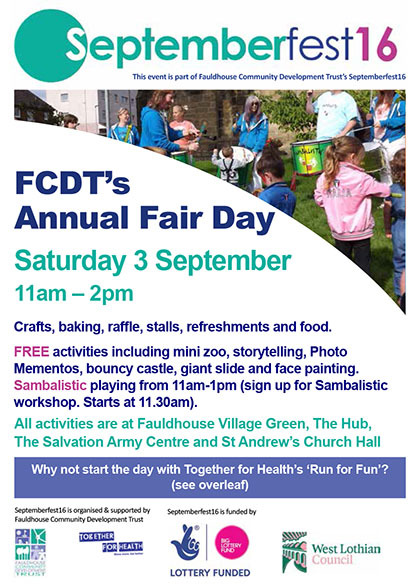 Septemberfest15 kicked off with FCDT’s Annual Fair Day on Saturday 5th September where the popular Sambalistic played their distinctive sounds and offered visitors the chance to play along too. 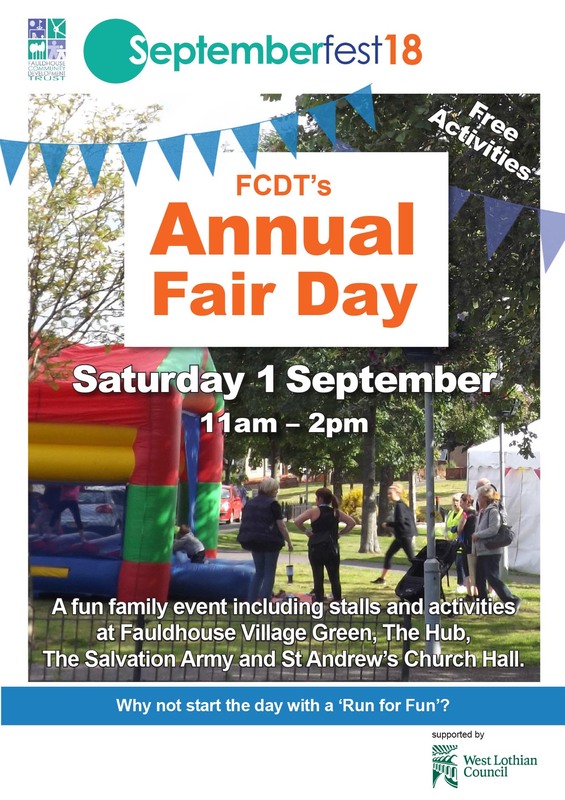 There were stalls, food and activities on The Village Green, in The Hub (10 Main Street), the Salvation Army Centre and refreshments were available in St Andrew’s Church Hall. Local groups and organisations had stalls and provided activities. There were crafts, baking and raffle. 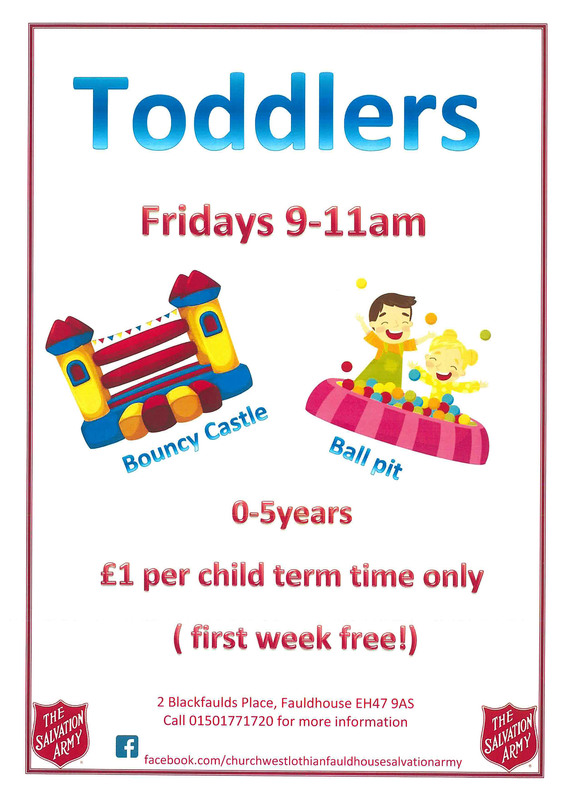 Activities for the kids were free including face painting, crafts and activities, cupcake decoration, a bouncy castle and mini zoo. Septemberfest15 events in the village ranged from Samba drumming workshops to musical movies at The Hub Community Cinema including The Buena Vista Social Club and for the Kid’s Cinema the recent remake of classic story Annie. Entrance was free for the cinema throughout September. There were also be performances by singers, young and old. New local talent was showcased at a Gala Day Fundraiser in the Fauldhouse Miner’s Welfare on Saturday 12th September. The Choral Highlights Choir performed on Wednesday 9th September at St John the Baptist Chapel Hall and there was an Evening of Music and Song on Wednesday 23rd. 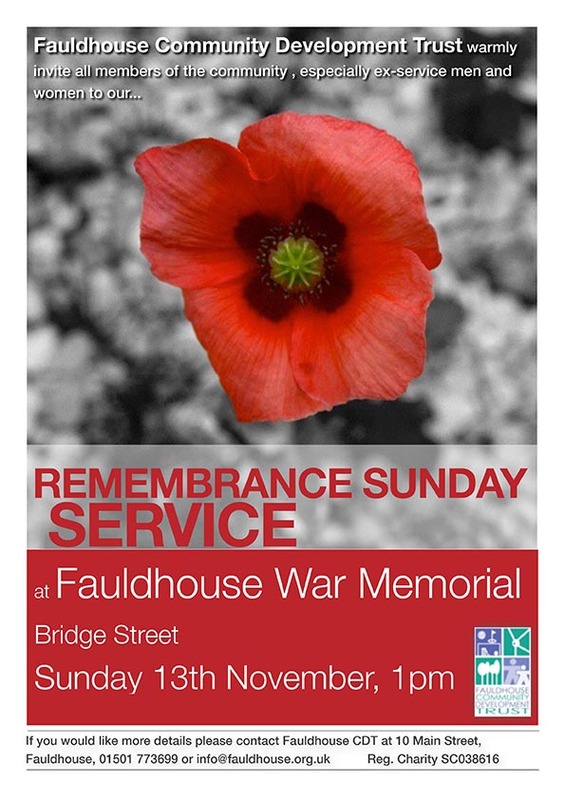 Bruce Davies performed at the Salvation Army Centre on Saturday 12th September. The Commercial Inn will had a Charity Day on the 13th and Greenburn Golf Club, a Comedy and Music Night on the 18th. The entertainment throughout the month should have suited all ages and tastes. 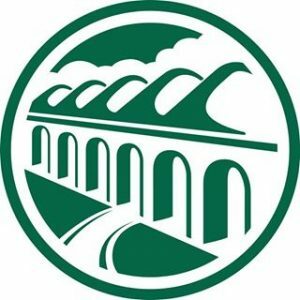 The month ended with a Charity Concert at Fauldhouse Miners Welfare Club on Sunday 27th September in aid of The Brain Tumour Charity, the line-up featuring an array of local musicians and entertainers. 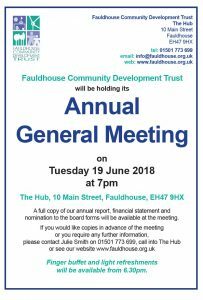 Thanks to Foundation Scotland and West Lothian Council Community Arts for their financial support to make the month of events in September in Fauldhouse possible.